The Vita Spa 300 series offers the great quality you’ve come to expect from Vita Spa at fantastically low prices. 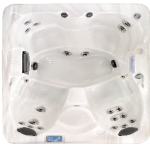 Aside from the Elegant which has more features, the 300 and 100 series hot tubs have 1 pump which means low cost easy installation as they can run off standard 13 amp electrical supply, and what’s more, the controls are from Balboa. If you’re looking for your first high-quality, entry-level hot tub that’s built to last, then look no further than the Vita Spa 300 and 100 series. As with all Vita Spa hot tubs, this range features the award-winning Bluemaax insulation for outstanding eco-friendly, heat-retention properties, keeping the cost of running your new hot tub to a minimum. The 300 series cabinets are made from a high impact composite, Excel-Xtm which looks and feels like real natural wood but without the numerous drawbacks.